Anyone who has ever shipped to an event is probably familiar with the special level of stress and frustration involved in coordinating show shipments. 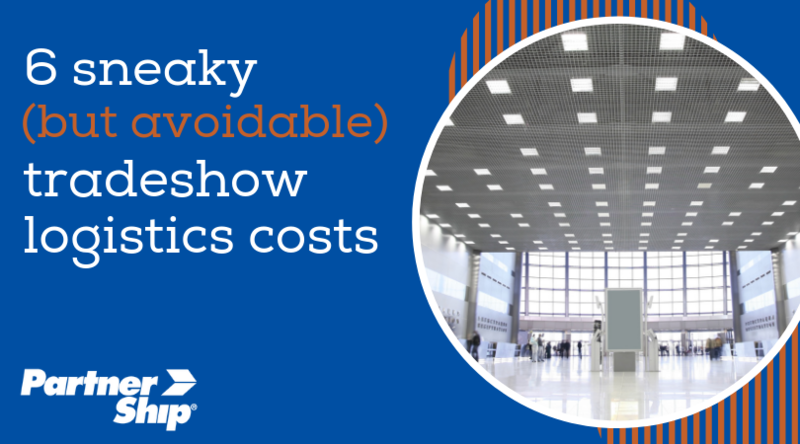 Tradeshow logistics is tricky business - not only are you juggling crunched timelines leading up to the show, but shippers also have to be aware of the many potential hidden costs involved throughout the process. Any misstep can end up costing shippers in surprise freight fees. The good news is that most of these costs are avoidable, as long as you know what to look out for. We've compiled a list of the things you need to keep an eye on to protect your special event freight spend. You have the choice to ship directly to the tradeshow floor or to an advance warehouse where your show materials are held leading up to the actual show start date. There are advantages and disadvantages to both, and as an informed shipper you need to weigh what makes the most sense for you. Shipping to an advance warehouse will give you more time to be flexible should anything go wrong or be delayed. Though material handling fees may be slightly higher, it doesn't cost more to ship to the advance warehouse. An added benefit is less worry about whether your shipment will arrive on time, and you get a leg up on the shipments arriving to the show site. Your shipment materials will be ready and waiting for you at your booth space when you arrive the day of set-up. Shipping directly to site can be tempting to avoid these initial material handling costs, but keep in mind that hundreds of other event shipments will be arriving at the same time as yours. If you've never seen a show-site marshaling yard, think of a rush-hour traffic jam during the last weekend of holiday shopping season. It's not pretty, and hold-ups cost lots of money in detention fees. If your shipment arrives late, the team waiting to build your booth will pass on overtime charges. If you're running extra-late, springing for expedited transportation charges will cost you even more. We've said it before, and we'll say it again: plan ahead, and build in extra time. Make your decisions based on what realistically makes the most sense for your business. The exact time your tradeshow shipment is loaded or unloaded is critical, and meeting your target time will save you significantly. In addition to open dates for both the advance warehouse and show site, there is a window of hours called straight time. These are the hours, and days, your shipment needs to arrive for the show in order not to be hit with overtime fees. This window is usually restricted to typical work hours, 8:00 am to 4:00 pm, for most shows, Monday through Friday. Anything that arrives after those hours, or on the weekends, will be considered overtime and incur extra charges. It is critical to check in your exhibitor packet exactly what hours and dates are safe for your shipment to arrive prior to the show. You also need to make sure your specific check-in time is noted on the material handling form, especially if your carrier arrives early. Often, a truck will arrive the night before, ahead of schedule. If there's no time noted, the driver may check in and get loaded on overtime, and this will increase your bill significantly. A great best practice to stick to is writing "load only during straight hours" in order to diminish the likelihood it will be loaded outside of that time, as well as act as documentation to help your case should your freight be loaded during overtime and you want to dispute the extra charge. Shipment damage or loss can occur at any time. While carriers do everything they can to keep them from happening, it's just an unfortunate part of freight shipping. With your load moving in and out of several different terminals (especially if your freight is traveling a greater distance), your shipment may encounter a renegade forklift or a heavy-handed loader. That's why it is key to package appropriately and securely. Custom crates are a great idea, especially for furniture and other fragile booth materials. Imagine arriving to a show and your seating is damaged and unusable. Sure, you have the option to rent a couch but it's going to cost you thousands for rental in addition to any repairs you will have to spring for to get things in working order for the next show. Because carrier liability is limited, it's always a good idea to look into additional freight insurance as a secondary option. Tradeshow shipment yards, docks, storage rooms, and show floors are all very congested places. Accidents happen, and should they happen to your show materials, at least you know your freight's full value is covered. Just keep in mind that every third-party insurance provider has different terms, so read carefully and make sure you fully understand the coverage you are getting. Did you know that materials being shipped to events have their very own class code? Don't worry, unless you are shipping to tradeshows regularly, most shippers don't either. Instead of calculating your shipment based on commodity type (furniture, signage, etc), any item either coming to or departing from a tradeshow should be rated Class 125. This can very well mean that the class is different than what you may be using on other shipments, and as a result, the price could be different than what you are used to seeing. It is important to get this quoted correctly, so if you are tempted to use a lower code because it's what you are used to, beware the risk of re-class. You don't want to receive surprise charges/fees when the carrier catches on and your shipment is rated higher than you wanted. The good news is that many booth material items such as chairs or desks tend to ship at a class higher than 125 anyway, so using a preset tradeshow-specific class code may save you. Material handling and drayage are common fees incurred by event shippers, and often the least anticipated. This type of handling refers specifically to transportation services from your carrier's delivery vehicle, at the dock, to your booth space. These services include unloading at the dock, moving your materials, as well as storing your empty containers for the duration of the show. Once the show is over, gathering the empty containers from storage as well as transferring the freight back to the loading dock will also incur fees. A top recommendation for tradeshow shippers is to crate your loads, rather than sending loose boxes. Some show decorators charge drayage based on how the shipment is packaged. Crating is the least expensive option and also adds protection against damage and loss by keeping your materials together. Completing a material handling form is crucial to setting up your outbound shipment accurately. Shippers know to have an accurate BOL prepared, but a material handling form is what the decorator looks at. The carrier name for pick-up must be noted, otherwise you will fall victim to "forced freight." This means the shipment will be sent with the decorator's carrier of choice, and that can be pricey. If it's a carrier your 3PL works with (for PartnerShip, UPSFreight or YRC Freight) an LOA can be submitted so you will be billed at your discounted pricing. If not, then you will need to pay the bill direct to the carrier. The tough part about drayage fees is that these services will be performed by a specific decorator that is under contract with the show. That leaves no room for shippers to negotiate with other options the way you might with transportation to and from the event location. However, there are ways that event shippers can try to keep these costs down as low as possible, particularly regarding packaging. The biggest factors determining drayage fees are weight and piece count. Each piece may be assessed a minimum charge, so make good use of palletizing or crating those loads! They are easier to transport to and from the showroom. Go lightweight for additional savings. Heavy building materials for your booth items will quickly increase your drayage bill, so stick to lighter more transportable building options for your booth tables and seating. It pays to put the time in to accurately plan how much product, booth materials, marketing collateral, giveaways, and anything else you may need. Successful event shippers create a strategy for what needs to be done before, after, and during the show. Check into any information regarding the tradeshow traffic from past years. Talk to the event coordinators and point people to gauge what you think you will need. Anticipate and plan for a little extra, but don't over do it. If you are going to be shipping to another show, look into whether it is more cost efficient to move directly to the next event rather than scheduling a return shipment back home. Very often, the storage fees at the next show location's warehouse may be cheaper than it would be to ship home then ship back out. You will have added peace of mind, again, that your shipment will arrive with enough time before the show so that you can concentrate on and prepare for the next show rather than worrying whether it will arrive on time. Managing tradeshow logistics can wear on the patience of even the most seasoned of shippers. Meeting deadlines and managing the details can be tough, and it can be tempting to step away and just hope everything goes smoothly. But, it pays to be diligent and well-informed, because that's the best way you can protect your bottom line from hidden tradeshow costs. If you're still feeling a little overwhelmed this tradeshow season, don't worry - the experts at PartnerShip can help. Call 800-599-2902 to speak with a tradeshow shipping specialist, or download our free white paper for more information about tradeshow shipping.